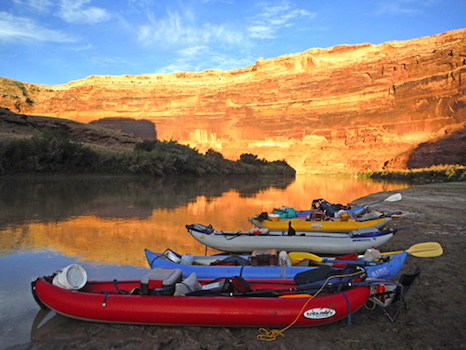 The section of the Green River most accessible from Moab is Labyrinth Canyon. This flat water stretch winds through a remote and pristine red rock canyon. Perfect for canoeists, flat water kayakers, and anyone seeking a mellow float Labyrinth canyon is rich with desert wonders; a kalidiascope of rock colors, petrified wood, the smells of where water meets earth, ancient rock art, incredible silence, azure skies, and my favorite, the descending call of the canyon wren. There are three launch locations Green River State Park (68 river miles), Crystal Geyser (65 miles) and Ruby Ranch (47 miles) and the takeout we access is Mineral Bottom. Depending on where you launch most trips range from 3-5 days. A permit is required to float the Green River, but as of January 2017 it is free of charge and easily acquired. You can obtain it in advance from the Moab Bureau of Land Management office, Green River State Park or Ruby Ranch. Green River State Park and Ruby Ranch both charge a small fee for launches. Call Ruby Ranch at (435) 650-3193, or Green River State Park at (435) 564-3633 for more information. Ruby Ranch does not charge an additional parking fee. There are no designated campsites along the rivers in Labyrinth Canyon. During periods of high water, camps can be difficult to find, especially for large groups. During late summer and fall, sandbars are usually plentiful and make ideal camps. Please make sure you are aware of upstream controlled water releases before your trip as they can affect river levels dramatically. All overnight trips are required to bring either a washable, reusable toilet or approved system that uses enzymes to break down waste suitable for the landfill. Firepans are required as well. From Green River State Park or Crystal Geyser to Mineral Bottom: $250 for one car and $215 each for two or more cars. From Ruby to Mineral Bottom: $290 for one car and $220 each for two or more cars. Note: There is an additional charge for oversized vehicles and trailers with vehicles on them. There is no charge for empty trailers. Another Note: All changes must be made prior to launch. You cannot just leave a note or a message about a new key hiding place, takeout date or cancellation. You must receive confirmation that the information was received from the office before you launch. There is no cell service at many of the launches, including Ruby Ranch, Potash and Mineral Bottom. Another please note: The shuttle for Labyrinth entails two long stretches of dirt roads. Both can be impassible when wet or worse, can completely wash out. There is usually a window in which we can move the vehicles but twice in 21 years we haven't been able to get a vehicle down the Mineral bottom grade due to circumstances beyond our control. Worst case, if you find your car isn't at the boat ramp, we didn't forget it, it will be at the top of the grade which is about 3 miles from the ramp. Most of the time, you will probably be able to get a ride up. I will try everything in my capabilities to get your vehicle there but sometimes Mother Nature is just too bratty.